Just five months after opening a Bunnings Warehouse in Rotherham, Australian retail giant, Wesfarmers has announced that it is selling up and pulling out of the UK market. Following a comprehensive review of the business, Wesfarmers announced that it has agreed to divest the Homebase business in the United Kingdom and Ireland to a company associated with Hilco Capital. Keen to climb up the ladder in the £38 billion a year UK home improvement and gardening market, the AUS$66 billion turnover Wesfarmers Group acquired the struggling Homebase chain in February 2016 for £340m. 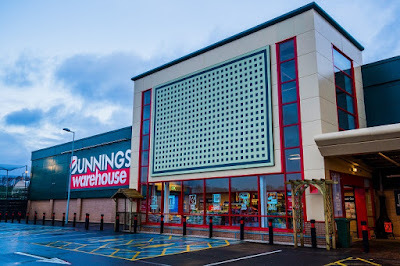 The company announced plans to invest up to £500m rolling out the Bunnings Warehouse format in the UK and Ireland over a five year plus timeframe. The store at the Northfields Retail Park at Parkgate was formerly occupied by B&Q but was vacant since June 2016. Opening in December 2017 and creating 80 new full and part-time jobs, the first Bunnings opening in the North of England measures over 70,000 sq ft and offers customers more than 30,000 leading home improvement and garden products. Executives have confirmed that the Rotherham store and the other 23 Bunnings pilot stores will convert to the Homebase brand promptly following the completion of the deal. Hilco Capital specialises in restructuring and refinancing other companies. Current investments include HMV and Staples' UK retail business. It was brought in to support Focus DIY and its owners Cerberus Capital in 2007. The DIY chain entered administration in 2011. Hilco is acquiring all Homebase assets, including the Homebase brand, its store network, freehold property, property leases and inventory for "a nominal amount." Wesfarmers said that it expects to record a loss on disposal of £200m to £230m in the group's 2018 full-year financial results. Rob Scott, managing director at Wesfarmers, said: "While the review confirmed the business is capable of returning to profitability over time, further capital investment is necessary to support the turnaround. The materiality of the opportunity and risks associated with turnaround are not considered to justify the additional capital and management attention required from Bunnings and Wesfarmers. "Homebase was acquired by Wesfarmers in 2016. The investment has been disappointing, with the problems arising from poor execution post-acquisition being compounded by a deterioration in the macro environment and retail sector in the UK. While it is important that we learn from this experience, this should not discourage our team from being bold and diligent in pursuing opportunities to create shareholder value. "A divestment under the agreed terms is in the best interests of Wesfarmers' shareholders and will support the ongoing reset and repositioning of the Homebase business." Bunnings UK and Ireland reported a loss before interest and tax of £97m for the half year ending December 31 2017. Pre-tax significant items of £531m were also recorded. With new management in place, Scott added that the operating performance of the business had improved in recent months. Is bunnings in Rotherham closing down then or will it become a home base store.